You are here: Home / Life / NFL Divisional Playoffs: Can Tebow Continue His Magic? NFL Divisional Playoffs: Can Tebow Continue His Magic? Last week we saw all four home teams win their matchups as the Texans, Saints, Giants and Broncos advanced to the division round of the playoffs. As we move forward in the National Football League playoffs, which teams will continue their journey and which teams’ journey will end? The Texans took care of business last week when they defeated Andy Dalton and the Cincinnati Bengals, 31-10. This week, they travel on the road and face the Baltimore Ravens. These two teams met up Week 6 when the Ravens won, 29-14. The Ravens were able to win that matchup because they were able to stop Houston’s run game. Arian Foster was held to 49 yards on the ground. This is nothing new for the Ravens, owners of second-ranked run defense. This will be a problem for the Texans considering rookie quarterback T.J. Yates will get the start. Houston’s bread and butter is the run game, as they showed last week against the Bengals when Foster ran for 153 yards. If Houston wants to win this matchup, they’re going to have to force turnovers. Dalton threw three interceptions (one was returned for a touchdown) and they were able to take advantage of it. In the end, however, the Ravens are undefeated at home this season and their defense will be too strong for the Texans and their rookie quarterback. The Saints continued their home winning streak against the Detroit Lions last week, but this week they have to go on the road and play the San Francisco 49ers. While the Saints are still an elite team, they are a completely different team at home and on the road. The Saints average 27 points during away games and 41 points during home games. New Orleans lost to teams like the Tampa Bay Buccaneers and the St. Louis Rams on the road this season, so it goes to show you they can be beaten. In both of those losses, the opposing team was able to force the Saints into turnovers. Against the Buccaneers, Drew Brees threw three interceptions and Pierre Thomas fumbled the football. Against the Rams, Brees threw two interceptions, one being returned for a touchdown. The Niners are one of the best teams at forcing turnovers on defense and not turning the ball over on offense. They finished with a league-best +28 turnover ratio. If the 49ers defense can cause enough turnovers and capitalize on them, then they have a great chance to win. The key for San Francisco will be to turn field goals into touchdowns. 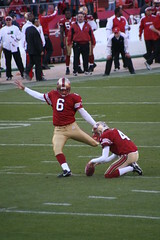 Kicker David Akers set an NFL record this year for most field goals made in a single season. He’s also made 18 kicks inside of 30 yards this season, which are kicks that need to be converted into touchdowns. Last week the Giants played great defense, as they didn’t allow the Atlanta Falcons to score any points on offense. Their offense played just as well, as the G-Men were able to win, 24-2. Their offense displayed a great balance between the run and the pass. Running backs Brandon Jacobs and Ahmad Bradshaw combined for 155 yards on the ground, while Eli Manning threw for 277 yards and three touchdowns. They get a tougher assignment this week, however, as they play the Green Bay Packers in Lambeau Field. Quarterback Aaron Rodgers has played lights out football this season, as he has lead the way for the highest scoring offense in the NFL. These two teams met up earlier in the season when the Packers won a close 38-35 game in New York. Rodgers threw for four touchdowns in that game. This game will be extremely similar to the one that was played Week 13. It will be high scoring with a lot of passing and the result will be the same. Tim Tebow and the Denver Broncos stunned the world as they pulled off yet another miracle last week when they beat the Pittsburgh Steelers in overtime. It was the fourth overtime victory by the Broncos this season. The Broncos get another tough matchup this week as they play a familiar foe, the New England Patriots. Denver lost 41-23 to New England Week 15 after a second-quarter collapse. The Broncos were up 16-7 at one point in that game, but they lost four fumbles. The turnovers proved to be too costly. The strange thing about this matchup is that former Broncos head coach Josh McDaniels just recently joined the Patriots coaching staff as an offensive assistant. McDaniels is the man responsible for drafting Tebow in Denver. The Patriots have lost their first game in the playoffs in the past two seasons, but don’t expect to see that this week.